In case you buy multiple products, the cost of transport is not multiplied, the system calculates the weight and cost for the total purchase volume. 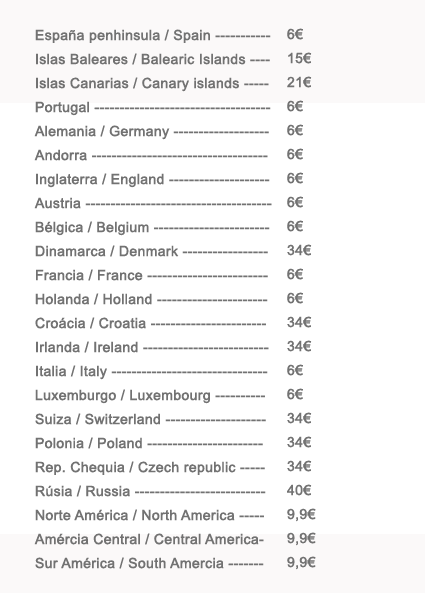 For shipments to areas of the European community with special tax regimes (eg Canary Islands, Ceuta, Melilla, Madeira, Jersey, etc ...) the buyer will be responsible for customs and duty if there were any. For shipments outside the European community, the buyer will be responsible for customs and duty if there were any. NAUTICADECOR shipments are made through different first level companies depending on destination country (MRW / TNT / FEDEX / GLS / POSTMAIL). 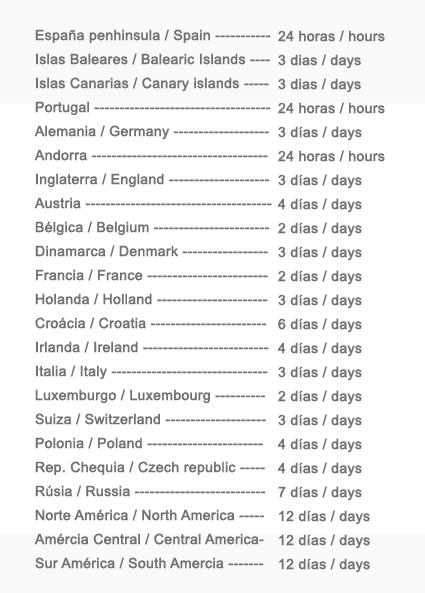 For example, a product that shippment is 48 hours and sent to Germany, the total delivery time is 5 days. If failure to deliver in 3 attempts, the order will stay in office MRW / POSTMAIL / TNT / FEDEX / GLS closest to the customer for 15 days. If after this period the customer has not picked up the shipment, this will be returned to NÁUTICADECOR applying return costs. To implement the right to refund the customer must demonstrate the failure within 3 days of receipt, and providing photographs of the condition of the packaging and layout at the time of delivery. All shipments are insured, except for shipments by POST MAIL, therefore, the client should not fear from breakage during shipping, in case of breakage the customer has the option of returning the money paid or the referral of a new model. POST MAIL does not accept the insurance breaks or losses, so NAUTICADECOR can not be responsible for shipments for this carrier. All our shipments are well packaged and packed, including notice of fragility in the same, so not having any problems during shipping.